The information on this page assumes that you are looking for beginner weightlifting training programs or that you are looking for advice on how to construct a beginner program. 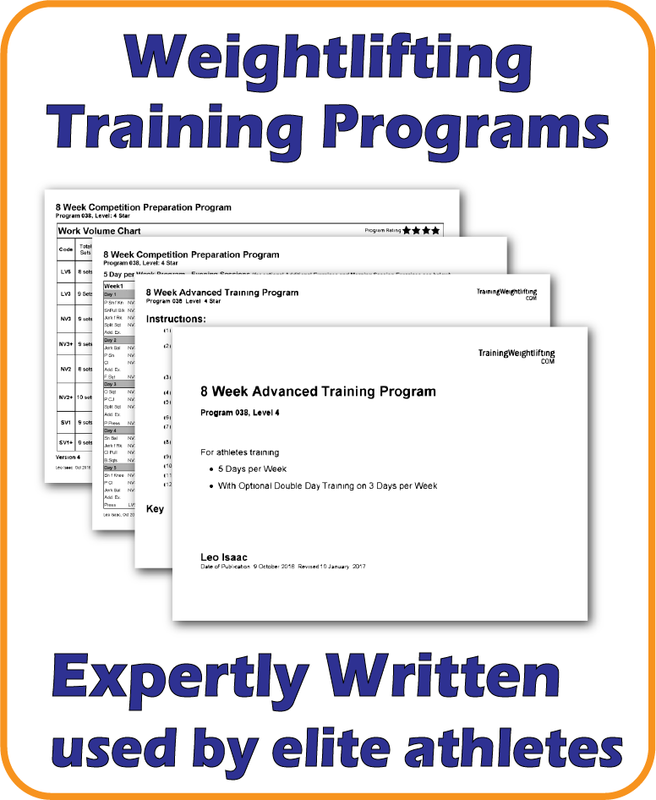 This site has section devoted to training methodology and how to develop training programs. Some of the articles are free and some require the visitor to subscribe. Read on for information about beginner and novice training programs. When the athlete is able to effectively demonstrate ‘full movements’ in the Olympic lifts, they may be regarded as Novice Athletes i.e. new to the sport. This period may last 1 – 2 years during which a great deal is learned about training, critical elements of skill are embedded, and the athlete has competed several times in competition. A novice athlete typically trains 2-3 times per week and in the first year, training more than 3 times per week is NOT advised. This is because it is important for the training process to be cautious and unhurried to allow the athlete time to adapt physically and mentally to what is a very challenging form of exercise. During the period that an athlete may be regarded as a novice, training programs need to be very explanatory. The athlete will need to rely on less moment-to-moment instruction by the coach and for this reason it is a good idea for training programs to continue providing plenty of descriptive information. In Olympic Weightlifting, as is probable in all sports, the early stages of skill formation are critically important. It is the expertise of the coach and the attentiveness of the learner that makes all the difference in the long-term as to whether skill, competence and competence is required. A training program is no substitute for a good coach. Nevertheless, training programs play an important role in the development of the athlete in Olympic Weightlifting. This is particularly the case when a coach cannot give full moment-to-moment attention to the athlete as in circumstances that they have a number of athletes to look after and/or cannot see the athlete training each day. Even when a beginner athlete is well coached on every occasion, a written training program that balances the needed exercises and workload is very helpful to the coach and the athlete. In particular, human memory cannot be relied upon to inform the athlete and the coach what exercises have been done recently. If a coach tries to work without a written schedule the inevitable question from the athlete is ‘what exercise do I do today?’ to which the coach will reply ‘what exercises did you do last session?”. Furthermore, if a beginner program is well constructed it is more than simply a list of exercises with stipulated sets and reps. For the beginner programs need to be much more descriptive and instructed, and it greatly helps if the program provides advice not only on what exercises to do but also how they should be done, i.e. what aspects of skill to focus on, how to proceed from set to set, and how to gauge how heavy to go. This information may not be needed when the coach is around but very definitely needed when they are not. This site is comparatively new but a considerable amount of work on training programs has already been undertaken. It is envisaged that work to develop many different types of training program will continue indefinitely. At this stage, 6 training programs available for novice athletes depending on the number of weeks available, and 2 separate and very different schedules/programs for beginners. Work continues! You can obtain and all of these beginner and novice programs by purchasing the ‘Novice Training Programs Bundle’.